Dower chest carved 1913 for Madge Payne . Who was Nellie Payne? 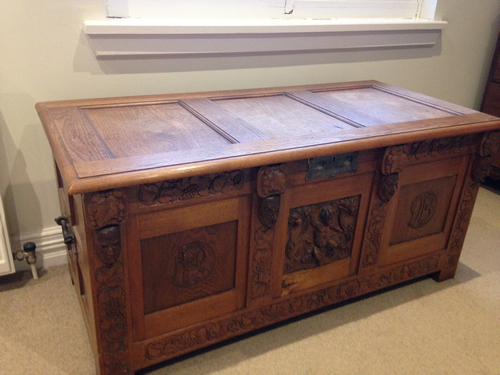 Dower chest for Madge Payne. 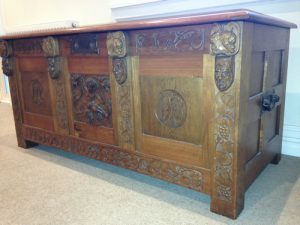 Close up front dower chest. Madge was Nellie and Dr Payne’s only daughter, and the eldest of their children, being born in 1888 in Hobart. Later the family moved to Melbourne, then London, where Madge went to Blackheath High School, one of the best of its day, and afterwards for a while at a school in Munich, Germany. It is not known why, but Madge had a glass eye, and was very self conscious of it, thus there are very few photos of her. Madge worked in a voluntary capacity for groups such as the Clarendon Children Home. 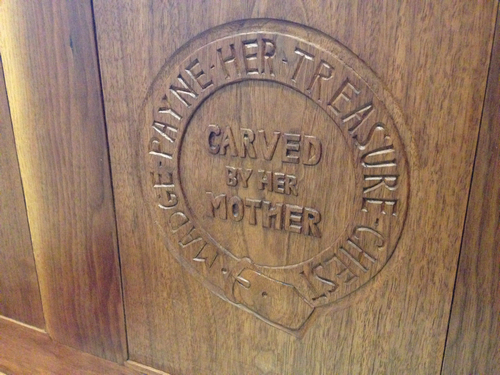 She looked after the domestic chores at No 26 Antill St. enabling Nellie to devote much time to her carving. She also worked as a voluntary aide in Darwin for Red Cross during WW2. Known as a very generous person, Madge gave much away to others. After Nellie passed away, Madge married (Edward) Gadesden Terry who was an apple orchardist at Hayes in the Derwent Valley. Madge had no children. 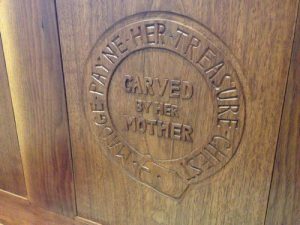 She also asked family friend and journalist – Russell Atkinson to write the book “Ellen Nora Payne – Woodcarver of Tasmania” – so that her mother’s work could be recorded for future generations. Our Nellie Payne subcommittee is indebted to Madge and Russell as they gave us a starting point when researching for this exhibition. Madge died in 1967, age 79. Her dower chest was the second one Nellie carved. It is made of American walnut and beautifully moulded little gargoyles headed each of the four uprights. It was fitted with an iron lockplate and handles and Madge’s monogram adorns the front panels. It has been passed down to her great nephew Christopher, who lives in Melbourne.